5 Ways Hormones Can Impact the Skin Many will agree that health issues are related to the burden of finances (prescriptions and medical supplies) and doctor’s appointments (paid-time -off). These same health issues can cause your self-esteem when it impacts your skin. Whether it be by dry, sensitive, itchy, or having crepe skin, it’s important to understand the root causes for a better approach to long-term skin wellness. What are hormones? Hormones: internal messengers for the body system and internal factors for the appearance, strength and skin health. 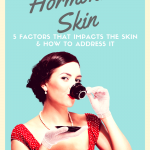 Hormonal skin: internal factors that can disrupt your skin barrier causing adverse outcomes to the condition of.